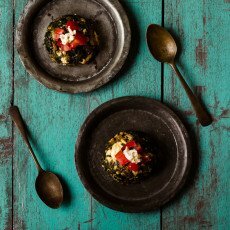 Palak Paneer Bhurji Recipe is a humble and fuss-free recipe of classic Indian side dish Paneer Bhurji with the addition of spinach. The straightforward flavours of creamy paneer and luscious spinach are combined together to create an ultimate comfort side dish for the lunch or dinner menu. Bhurji is the common term widely used across the by-lanes of the Indian subcontinent. The term Bhurji refers to a quick stir-fry dish made with either egg, paneer or any easy to cook ingredient. Behind the scene, we are working on few exciting surprises lined up for our blog readers, one of them that might interest you as a reader is the fabulous series of guest posts lined up from some talented blogger friends of mine. 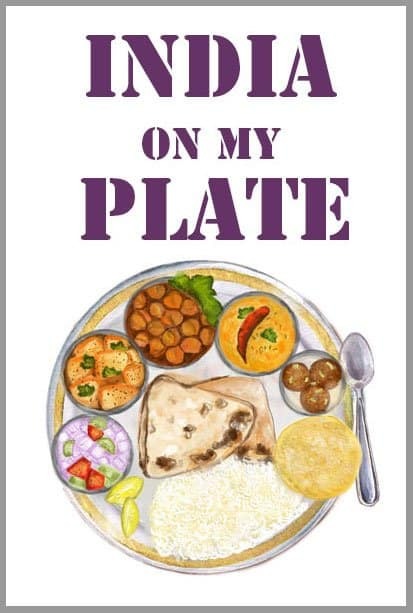 With the post of Palak Paneer Bhurji by Deepali of Lemon in Ginger we are inaugurating the Guest Post series on the blog. Deepali is a dedicated home-maker living in the city of retirees – Pune, having two naughty kids who try their best to keep her on toes. We connected sometime last year through Instagram. We started conversing through comments on each other’s Instagram feeds, switching to inbox messages and eventually way beyond the virtual world. This time while I was jotting down the list of invitees for the guest post series her name definitely has to be in the list. Her blog Lemon in Ginger is the true showcase of her journey as a blogger to photographer. 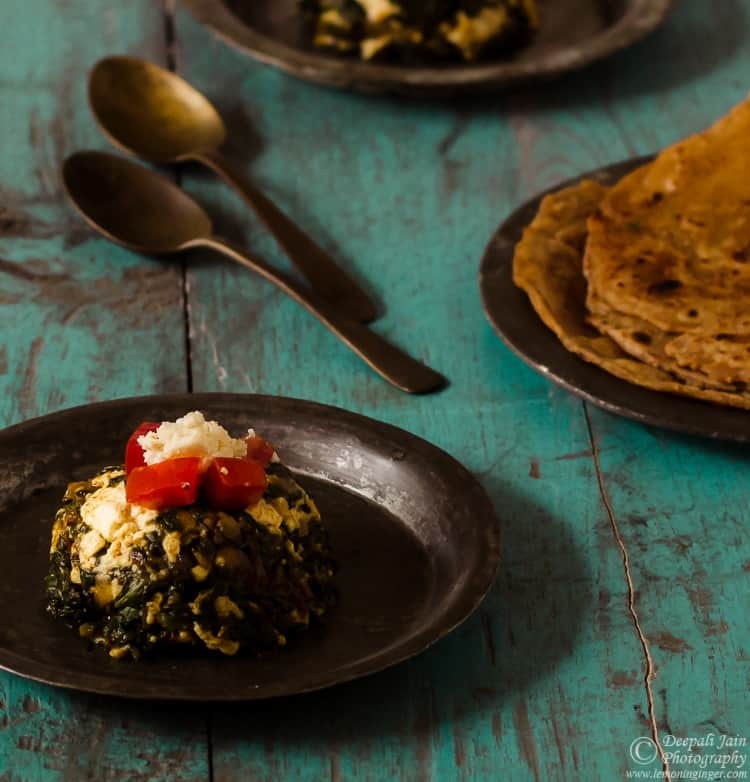 Palak Paneer Bhurji Recipe is a humble and fuss free recipe of classic Indian side dish Paneer Bhurji with the addition of spinach. To prepare the Palak Paneer Bhurji, heat oil in a stir fry pan (buy it here) over medium heat, add asafetida, ginger, cumin seeds, turmeric powder, red chili powder, coriander powder and saunf. Roast the spices for a few seconds or till their aroma is released. Add chopped onion and saute till onion turn light brown in color. Add chopped tomato and green chilli to it. Mix it well. Then add chopped spinach to the mixture. Allow it to cook for few minutes. Once the spinach turn soft, mix it well with the spices and add salt. Be cautious while adding salt as the quantity of spinach reduces drastically after cooking, so you would need much lesser salt. Cover the pan and allow the spinach to cook for few minutes. 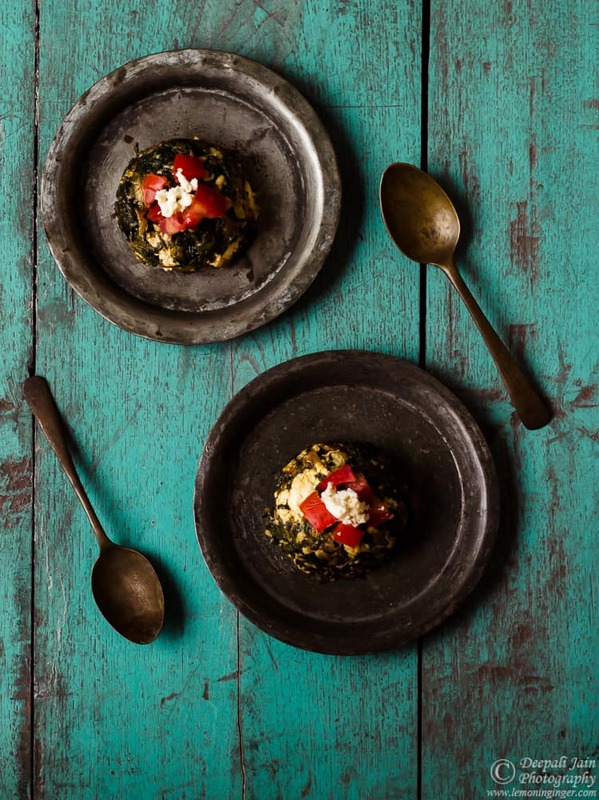 Serve Palak Paneer Bhurji with Phulkas and dal for lunch or dinner. The idea of converting palak paneer into bhurji is awesome and I really appreciate this attempt…wonderful recipe…. 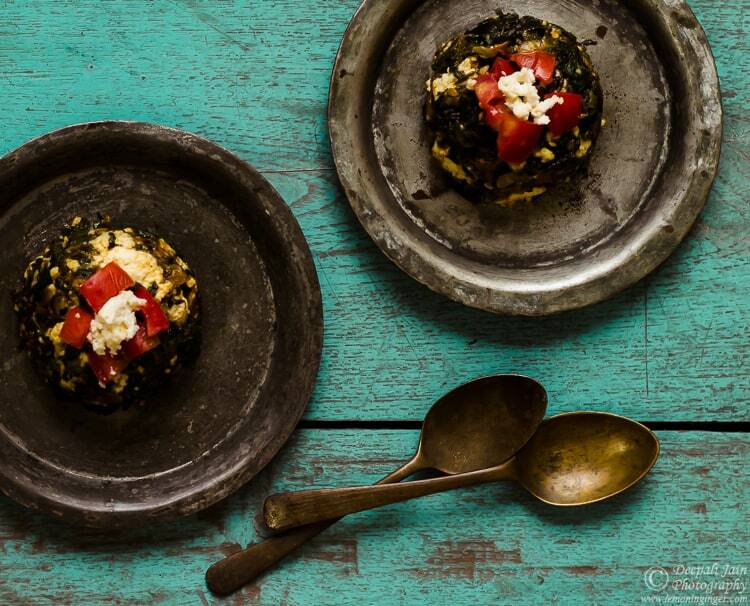 I make paneer bhurji but have never tried palak-paneer bhurji. Will definitely try it.